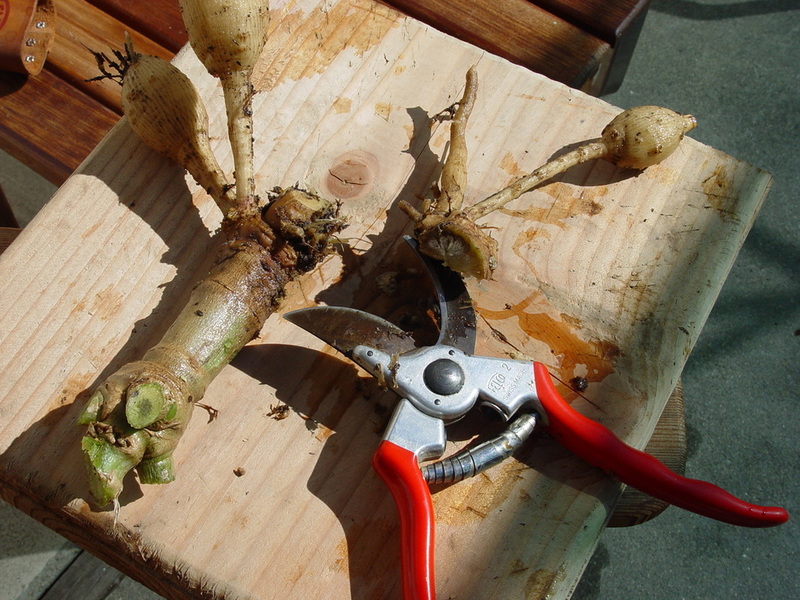 Cut back the stalks leaving about 6” three to four weeks before you plan to divide the tubers. 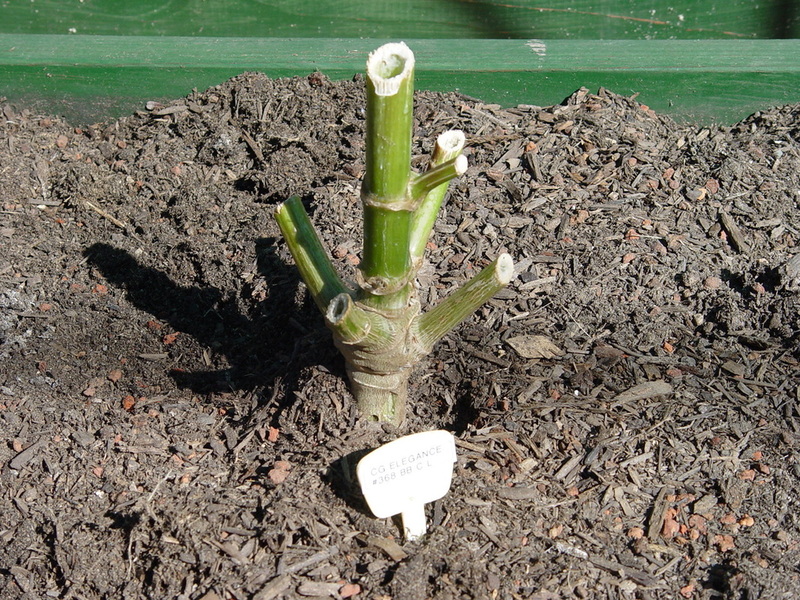 Start by taking a spade 10”-12” away from the stalk and dig straight down all the way around the stalk. Gently lift the clump out of the ground using another spade or pitchfork. 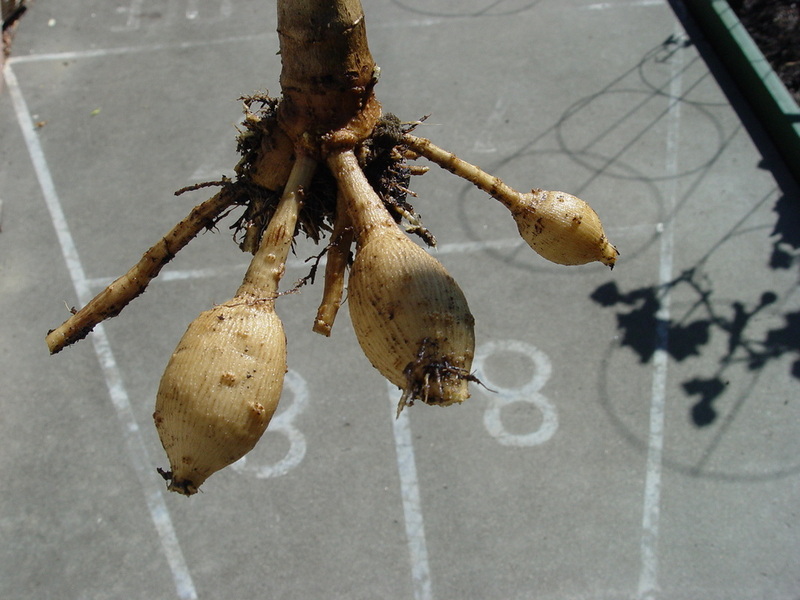 Try not to break any of the necks of the tubers from the stalk. 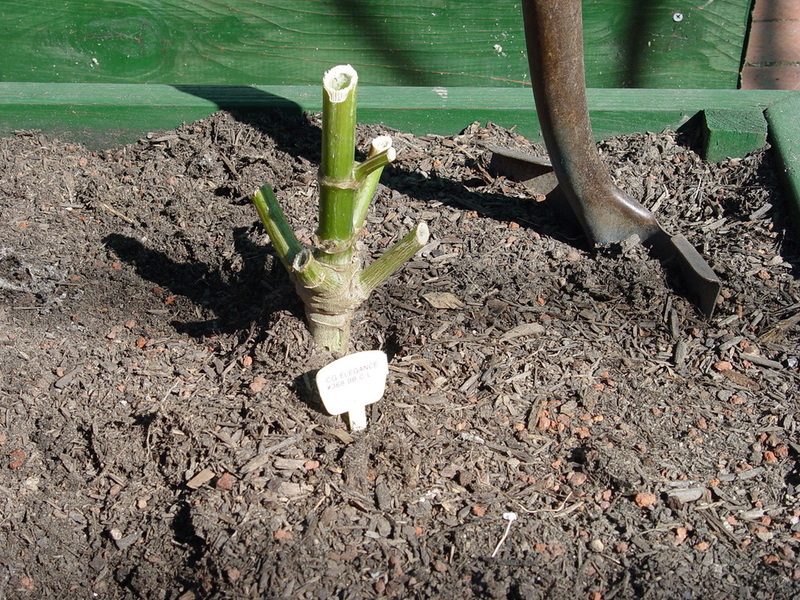 Gently use your hands to brush away some of the loose soil around the clump. 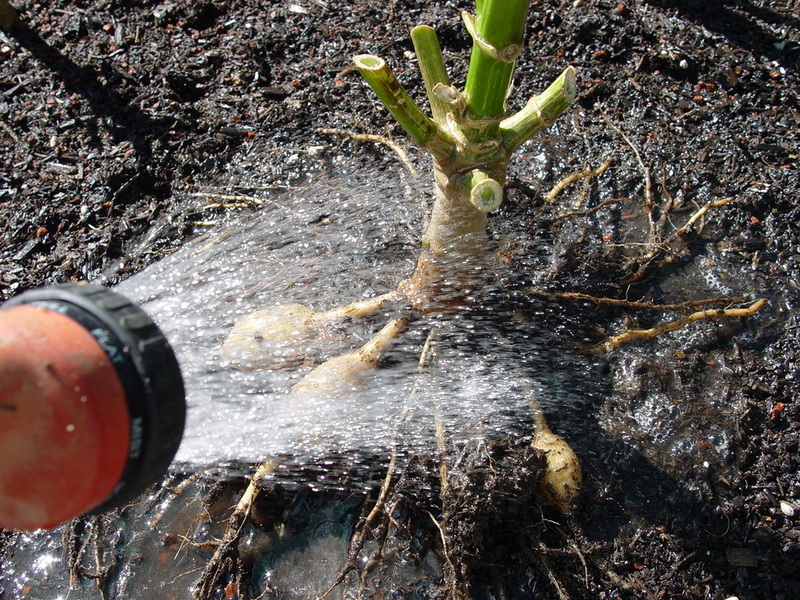 Spray the clump with a hose to wash away the dirt around the clump. Use the jet spray to get all the dirt off of the clump. 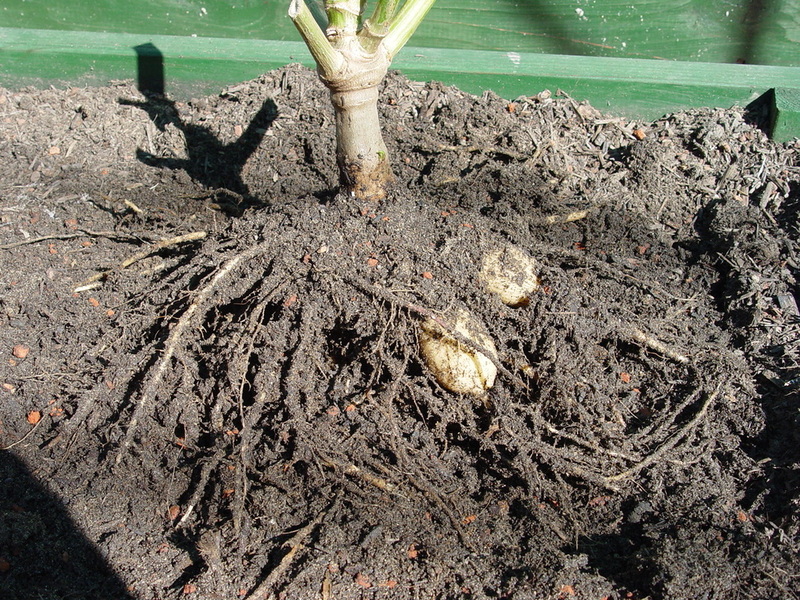 Now you should trim away the feeder roots as well as the tips of the tubers. This is what your clump should look like now. 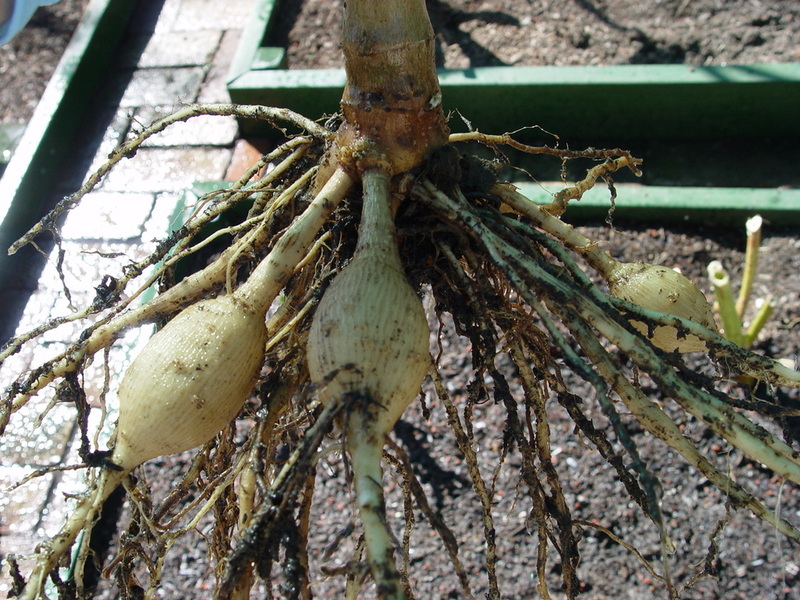 Always be careful NOT to break any of the necks of the tubers - if you do they won’t grow. 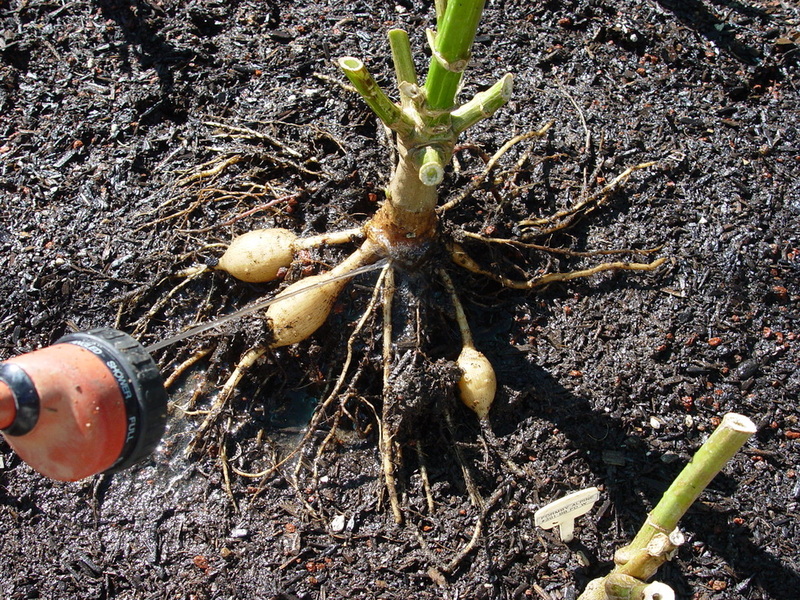 Look for the “eyes” at the base of the tubers where they connect to the stalk. 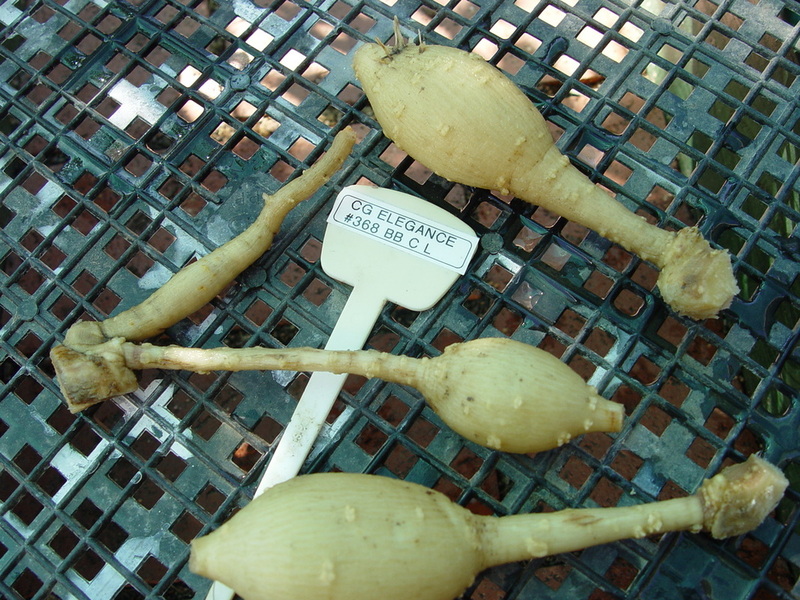 You want to divide the tubers with an eye connected to a piece of the stalk in order to have a tuber that will grow next year. Rinse off any excess dirt, and place the tubers in a 1 to 10 part bleach solution for five minutes. 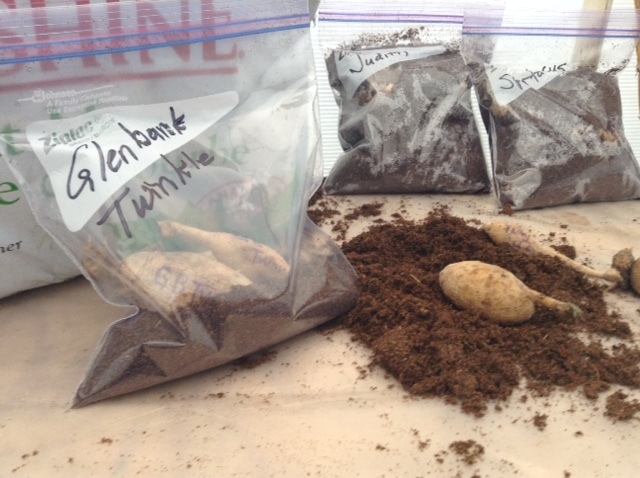 Be careful to keep track of which tubers came from which plant so you won’t get them mixed up. 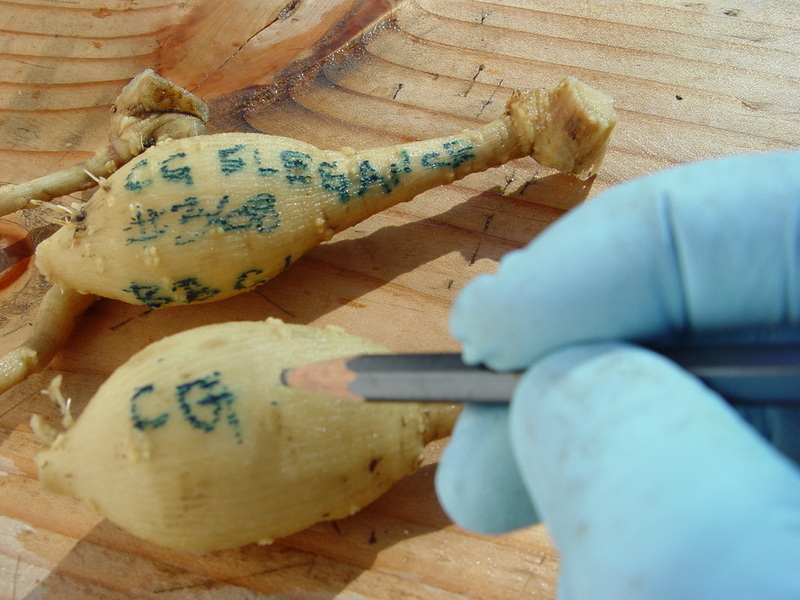 Remove them from the bleach solution and label each tuber properly using a No Blot pencil (or a Sharpie marker when the tubers are dry). 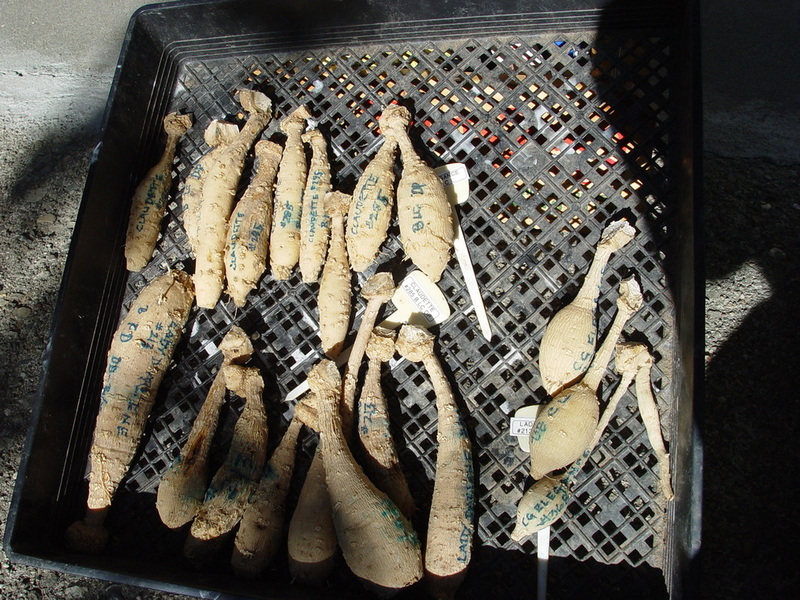 Allow the tubers to fully dry before storing. You may wrap them in shredded newspaper, place them in vermiculite or in damp peat moss. You want to completely cover them and store in a cool dry place. 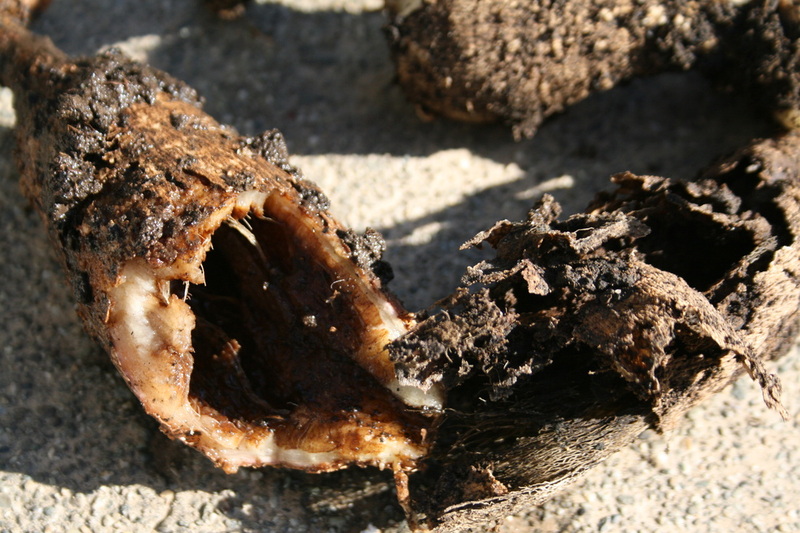 Check the tubers a month after you have stored them for any that may have rotted. Discard the ones that have. 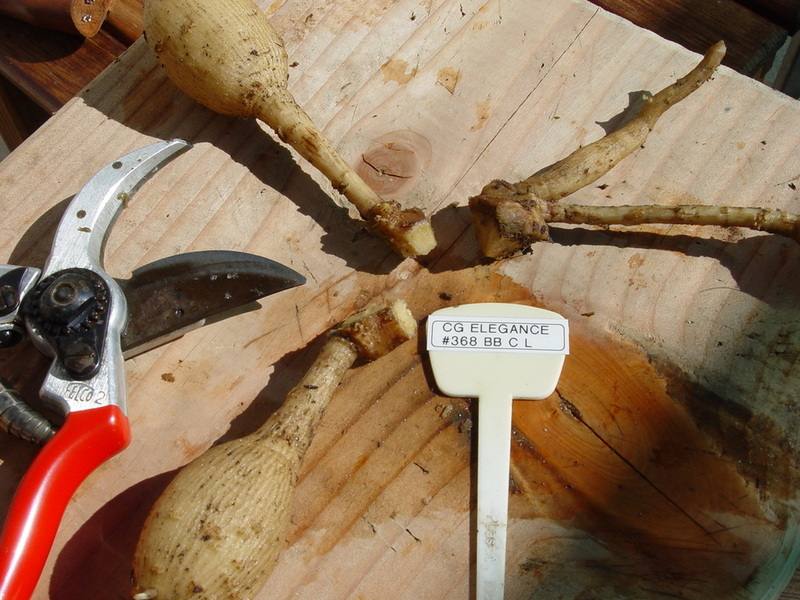 Thank you, DJ Eckelbarger, for the photo essay and clear directions on how to dig and divide dahlia tubers. Some people do this in November, while others wait until December, January or possibly February or March. What happens if you choose not to dig and divide? Good question! 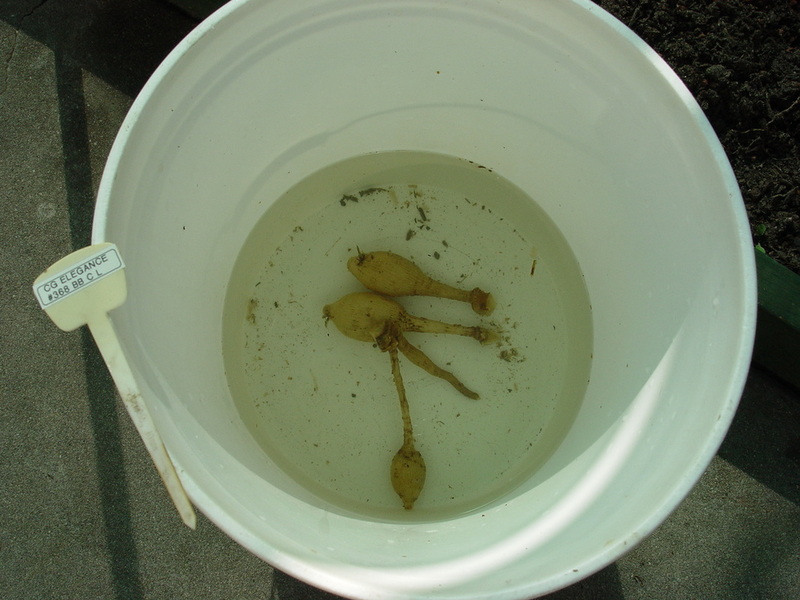 Sometimes the tubers will rot and you will have nothing the following year, as this photo shows. Sometimes you will have lots of shoots, so you will have early flowers, but they may be smaller the second year and even smaller the third year.